A PKK bombing with an explosive-laden minibus targeted police headquarters in Midyat in southeastern Mardin province on Wednesday, killing two female police officers and two civilians near the scene of the attack and wounding at least 34. Wednesday's attack in Midyat was the second in the country in the last two days. Following Tuesday's suspected PKK car bombing in Vezneciler in Fatih, Istanbul, which killed 11 people, the PKK conducted a car bombing in Mardin. After visiting the wounded in Tuesday's attack in Istanbul, Prime Minister Binali Yıldırım gave a speech in front of the hospital and answered journalists' questions. When asked about who was responsible for the bombing in Midyat, Yıldırım said it was "the murderous PKK terrorist organization that carried out the attack." "We will fight them both in urban centers and rural areas with determination," he added. 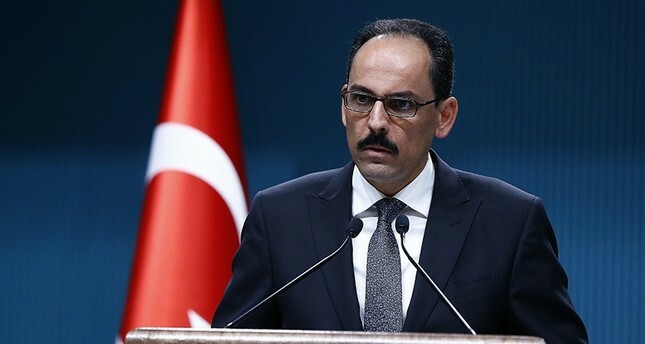 Presidential spokesman İbrahim Kalın held a press conference at the Presidential Palace on Wednesday in which he touched on the two recent bombings and other issues on the agenda. Kalın said the European Union should not ask Ankara to soften its anti-terrorism laws in such an atmosphere. He also slammed U.S. President Barack Obama's administration for collaborating with the Syrian PKK affiliate Democratic Union Party's (PYD) People's Protection Units (YPG) militia in the Manbij operation. "I would like to ask the countries sending us condolence messages: Do our European friends know how many front organizations this PKK terrorist organization has in Europe? Double standards and hypocrisy should end. They should stop fostering relations with the PKK's offshoots while sending us messages of support," Kalın said. Slamming the 28-nation bloc's demand that Turkey narrow its definition of terrorism in its anti-terrorism laws, Kalın said: "Instead of giving suggestions that could debilitate Turkey's fight against terrorism, our European friends should stand by Turkey on counter-terrorism without any compromise." Footage from the scene shows many buildings heavily damaged by the explosion. According to local sources, many children were wounded because a children's park is very close to the site of the attack. There have been clashes and months-long curfews in Mardin province, as part of the fight against the PKK in the southeast. Security forces recently announced that operations in the Nusaybin district, one of the areas in Mardin with the most intense conflicts, ended over the weekend, after nearly three months. Some 42 PKK terrorists, including 10 women, surrendered in late May during counterterrorism operations in Nusaybin. Those who surrendered reportedly included wounded terrorists. Previously, 25 others surrendered. Some 437 terrorists have been killed since the start of operations in Nusaybin, 400 barricades have been removed, 35 ditches have been filled, and 1,024 handmade explosives have been destroyed. The reconciliation process and accompanying cease-fire between the state and the PKK collapsed in July after the PKK killed two police officers, leading to renewed fighting in a war ongoing for more than 30 years that has led to the deaths of around 40,000 people.